Some contents of the Haish mansion have been residing just an hour from their original home. Chandeliers, woodwork, and even statues from the mansion can be found in Rockton, Ill., because of antique collector Walter Williamson, who was from Winnebago County. Historian Steve Bigolin and I recently visited Rockton to see the items, and he told me the story he had dug up in the 1970s. Bigolin said shortly before the mansion's demolition, Williamson purchased scavenger's rights to the mansion for $1,200. In 1973, Williamson told Bigolin he recalled filling four trucks with various items. To this day, just some of those items can be found in a Chinese restaurant and on the grounds of a golf course in Rockton. The outcome of any other items is unknown. Williamson had owned the Wagon Wheel Resort in Rockton, which consisted of a golf course, swimming pool, bowling alley, theater, and much more, and was open from 1936 until it closed in 1989. Williamson used some of the Haish items throughout the resort. Today, the China Palace Restaurant, which was formerly known as the Junior Wagon Wheel, and the Red Barn Golf Course, which was part of the resort, now have new owners but still feature the Haish memorabilia. The golf course features the "two lions" that were seen for many years on the Haish lawn in DeKalb. Today, the two statues stand guard outside along the drive into the golf course, and although they are very weathered, you can still make out the phrase "patentee of barb wire," "Jacob Haish," and the bust of Jacob himself. A short drive from the golf course is the China Palace Restaurant. Upon walking in you immediately see pieces from the mansion that have been repurposed and carefully woven into the decor of the restaurant. A staircase post and woodwork can quickly be picked out. The dining room area also features two chandeliers from the mansion, which Bigolin believes would be worth much more than the $1,200 Williamson originally paid to remove items from the mansion. 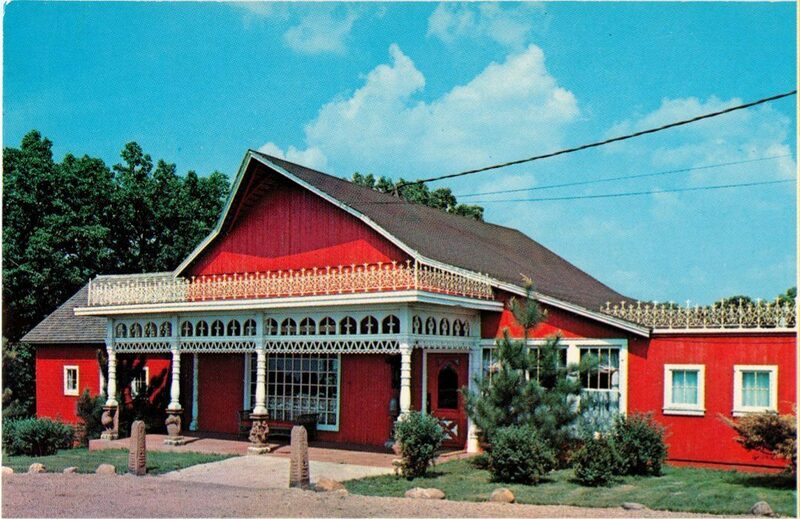 The Red Barn Theatre, which at one point was part of the resort, also featured porch posts and trim from the Haish mansion, but is no longer standing.